Arches National Park is very simple to find. Just take US Highway 191 north from Moab, UT and the park headquarters will be obvious on your right just after you pass the Colorado River. From there, it is simple to take the park’s main road up to Wolfe Ranch / Delicate Arch Viewpoint Rd. Turn right and a couple of miles later, you are at the parking lot. 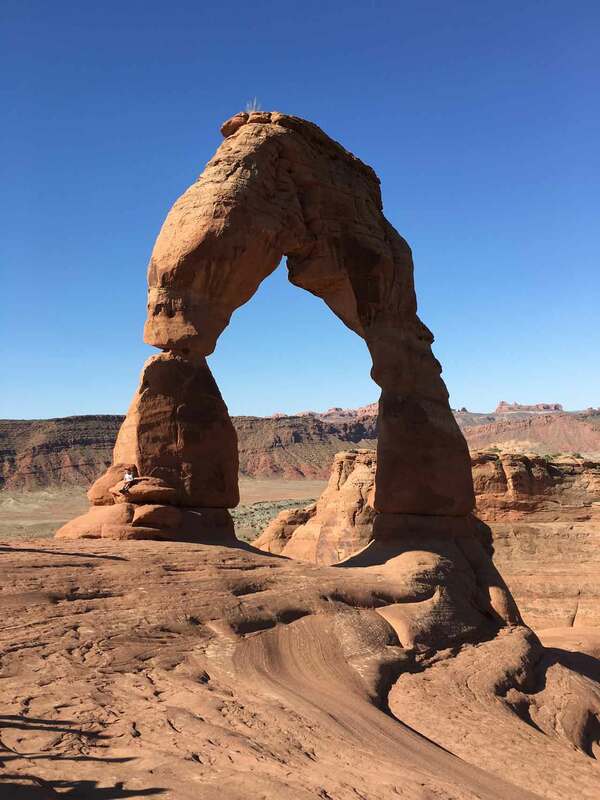 The Trail to Utah Delicate Arch rises about 500 vertical feet beginning about 4300 feet and rises up to 4800 feet. aware that there is a change in elevation of about 500 vertical feet as you climb up to the arch. At the beginning of the hike, you will find 2 short side stops that you can take. First, you will see the Wolfe Ranch cabin on your left. 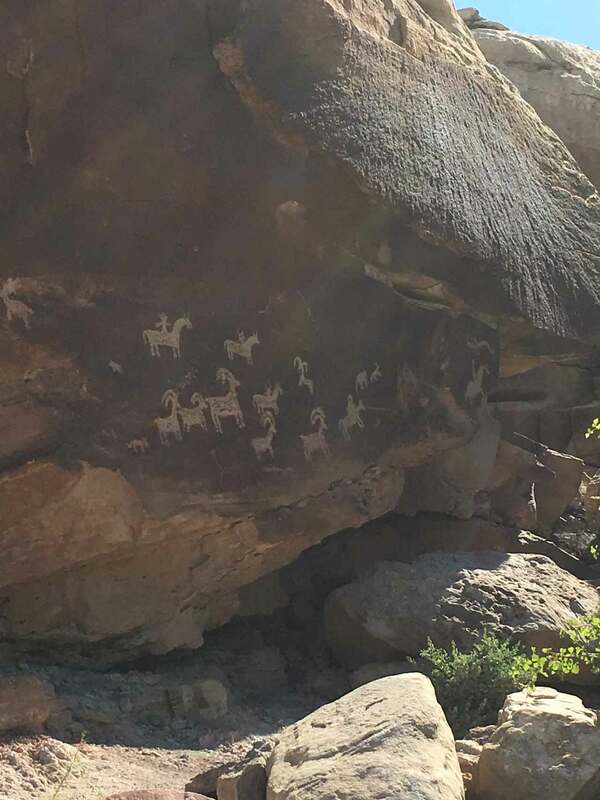 This is the cabin where a nearly 70 year old John Wesley Wolfe and son Fred Wolfe moved to seek a more favorably dry climate and happened to move next to this awesome Utah landmark. At this point, you can look into the windows to get a glimpse of what is inside. 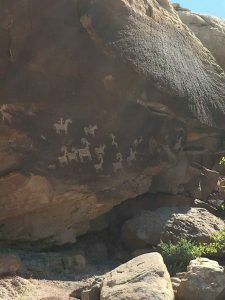 A moment past the Wolfe cabin and you pass some really cool and very well-preserved indian hieroglyphics. They are up on a rock above the trail. 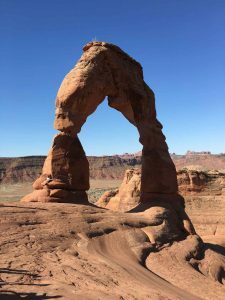 We decided to move on the Delicate Arch trail to the arch and visit these side trips on the way back. You don’t see the Delicate Arch until you are nearly there. There is a small window that you can look through as you get close that offers you your first view. As you come around the rock wall, you will see the Delicate Arch is on the other side of a slickrock bowl. the people. They probably did not mean July 4th on any year. It was very busy. We started our hike at 8:15am. Perhaps a couple of hours earlier would be better. Whether there are a lot of people or not, it is a magnificent site particularly with the Manti LaSalle Mountains in the background. You need to be sure that you are prepared for the hike. Wear comfortable shoes, clothes for the warm weather, sun block, a hat, and bring plenty of water! If you arrive at the park without enough water, they have a spigot for you at the park headquarters visitor’s center. It can get very hot with very few clouds and one can get dehydrated or sunburned very easily out there. Please remember to be prepared before you begin Hiking Delicate Arch Moab Utah. The park is undergoing road construction. The park road is closed 7 PM – 7 AM in order to do the construction at night and interfere less with daytime visitation. Therefore the Devils Garden campground is closed this year. And the Fiery Furnace hikes will not be available, likely to set up machinery in that parking lot.